KINGMAX has consummated its product line of M.2 2280 PCIe NVMe solid-state drives (SSDs), providing users who want to improve their PC performance with a greater variety of choices. In addition to the ultra-fast M.2 PCIe SSD PX-3480 (Gen3x4) and the PX-3280 (Gen3x2), the affordable/entry-level PJ-3280 (Gen3x2) has also been introduced. An increasing variety of motherboards or notebooks are currently available on the market, including motherboards equipped with Intel Z270, X99 and the latest 2 Series/3 Series chipsets, all of which are equipped with the M.2 PCIe interface as standard equipment to enable future upgrades. As long as the M.2 slot is the M key version, a solid-state drive that comes with the M.2 PCIe interface can be employed to push the speed and performance of a computer to higher levels. 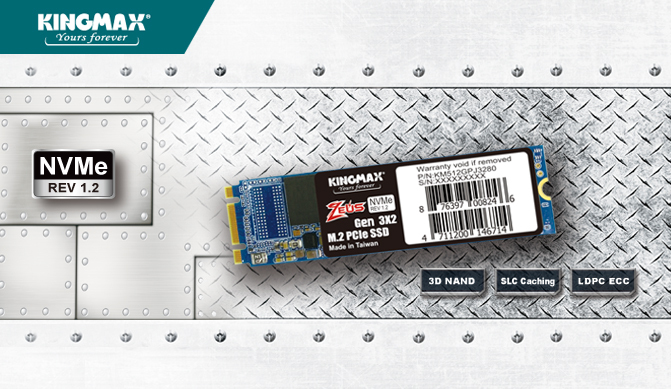 The KINGMAX M.2 2280 NVMe SSD PJ-3280 (Gen3x2) is manufactured using 3D NAND Flash stacking technology, making it highly efficient, stable and durable. Meanwhile, the M.2 2280 is 22x80 mm in size and is available in capacities of 128GB, 256GB or 512GB, suitable for improving the performance of space-challenged notebooks and ultrabooks while expanding capacity.